- Contour cut to match your vehicle washing application. Diamond Pad Holder, Size: 8" / 12" / 15" / 16" / 17"
Size: 8" / 12" / 15" / 16" / 17"
Use Kibble MICROFIBER PAD with Kibble floor/hand scrubbie for delicate surfaces. Inventa 17" 3M Buffing Pad, Size: 17"
- Blue Cleaning Pads 17"
This is the product to keep your utensils clean of tough stains. Designed in a manner to safegaurd your skin from getting rough. Available Color: Blue, Red, Black, Green etc. 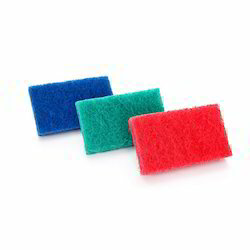 We offer Abrasive Cleaning Pads to our clients.